File photo Leah Snow was crowned Miss Poppy 2017 when she was 6-years-old and a kindergarten student at Wright Campus. FAIRBORN — The American Legion Auxiliary Dignam-Whitmore Unit 526 is hosting its annual Miss Poppy contest. The competition is slated for 5 p.m. Thursday, April 17 at the Fairborn Senior Center, 325 N. Third St. The contest is open to any kindergartner or first grade female student in the Fairborn and or Bath Township areas, in addition to Auxiliary 526 junior members. Miss Poppy’s duties include helping to promote the Auxiliary’s Poppy Program by being available to distribute poppies on Saturday, May 19, participate in the local Memorial Day services and ride in the Fourth of July Parade. Three out-of-town judges will select the 2018 Miss Poppy. She will be selected on the basis of appearance (25 percent), personality (25 percent) and self assurance (50 percent). Parents or guardians of the contestant must be present for the judging. Contestants are also requested to bring some form of birth date verification. She will be crowned during the American Legion Auxiliary Mother/Daughter Banquet slated for 3 p.m. Sunday, May 6, at the Fairborn Senior Center. Miss Poppy will receive a dress, crown, sash and charm. Deadline for entry is Sunday, April 8. Entry forma will be distributed to the kindergarten and first grade students the week of March 19. Individuals can also contact Pat Drake at 8419 Philadelphia Dr. Fairborn, Ohio 45324. 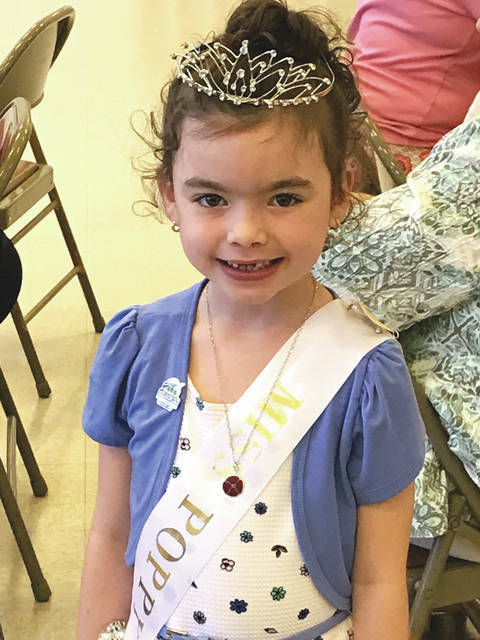 Leah Snow, daughter of Stuart and Leigh Ann Snow, was crowned Miss Poppy 2017 as a kingergarten student at Wright Campus during the American Legion Auxiliary Unit 526’s annual Mother/Daughter banquet last year. Snow received her crown, a silver chain with a poppy charm, sash and dress from the unit. She loves to dance and takes classes at the Miami Valley Dance Center; she also plays basketball with the Upwards program at Victory Temple. https://www.fairborndailyherald.com/wp-content/uploads/sites/50/2018/03/web1_Miss-Poppy-1.jpgFile photo Leah Snow was crowned Miss Poppy 2017 when she was 6-years-old and a kindergarten student at Wright Campus.